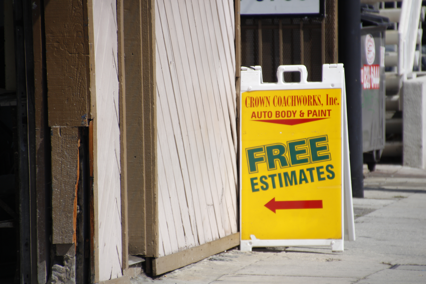 Crown Coachworks Auto Body and Paint provides free estimates on auto body repairs. We are lease return experts. Stop by for free estimates. 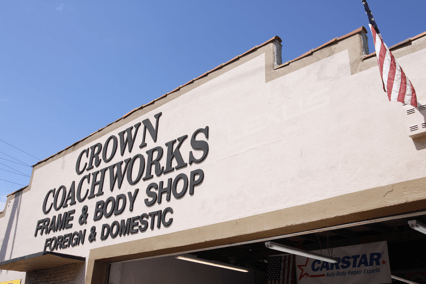 Crown Coachworks auto body repair center is centrally located in West Los Angeles, California, just minutes away from Bel Air, Beverly Hills, Brentwood, Culver City, Malibu, Marina del Rey, Pacific Palisades, Santa Monica, West Los Angeles, and Westwood. From Fairfax District and Beverly Hills: Take Olympic Boulevard heading West until you reach Sepulveda Boulevard. Turn right at Sepulveda Boulevard. Crown Coachworks Auto Body Shop, at 2122 South Sepulveda Boulevard, will be on your right less than 100 feet from the corner of Olympic and Sepulveda. At Crown Coachworks Auto Body & Paint we take pride in service and quality of repairs. We are here to be of service to you. From Santa Monica, Pacific Palisades & Malibu: Take the 10 FWY heading East to the 405 FWY North. Exit on Santa Monica Boulevard. Turn right onto Santa Monica Boulevard. Turn right onto Sepulveda Boulevard. Crown Coachworks Auto Body Shop, at 2122 South Sepulveda Boulevard, will be on your left side less than 100 feet from the corner of Olympic and Sepulveda. From Simi Valley and San Fernando Valley: Take the 101 Freeway East to 405 Freeway South. Exit at the Olympic/Pico off ramp. Turn right towards Olympic Boulevard. Proceed to Olympic, and turn right. Continue 2 blocks to Sepulveda Boulevard and make a left onto Sepulveda. Drive less than 100 feet to Crown Coachworks Auto Body Shop, 2122 South Sepulveda Boulevard, which will be on your right. 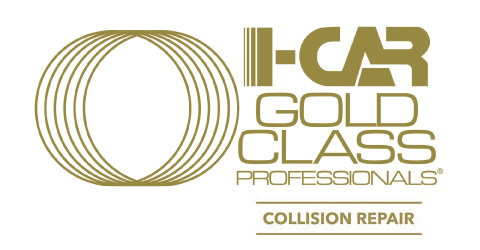 Monday through Friday 7:00 a.m. – 5:30 p.m.
Sunday 9:00 a.m. to 12:00 p.m.
Crown Coachworks Auto Body & Paint, voted one of the best auto body shops in Los Angeles by customers, proudly serves Los Angeles, California 90024, 90025, 90034, 90049, 90064, 90066, 90067, 90077, Beverly Hills, 90210, 90211, 90212, Brentwood, 94153, Culver City, 90230, 90232, Malibu, 90263, 90264, 90265, Marina del Rey, 90292, Santa Monica, 90401, 90402, 90403, 90404, 90405, 90406, 90407, 90408, 90409, 90410, 90411, West Los Angeles, Westwood, and beyond for since 1968.